I finally got the opportunity to play “Spirit Island” by Greater Than Games at Gen Con 2018. This has been a long time coming as I have the game on my amazon wish list, have watched videos of play throughs, and rules explanations, and have even listened to a very lengthy podcast featuring the designer. I didn’t get to finish a complete game, but did play for 2 hours and got a pretty good feel or the game. As I suspected, I was not disappointed in any way. 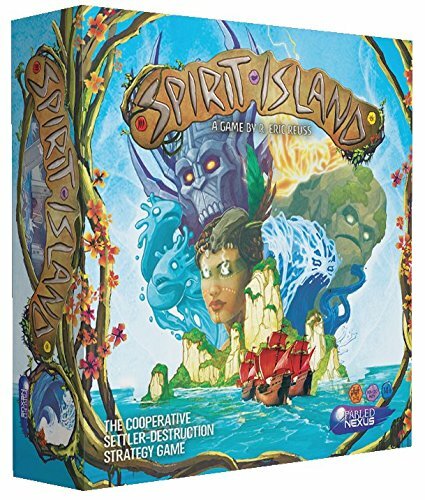 The idea behind the game is that the players are different specific spirits and are working together with the indigenous group on an island to fight off a colony of settlers who are attempting to take over the island and colonize. The theme of the game really shined for me. It seemed like every mechanic was added to make me feel like a spirit trying to save my island over the course of many years. There is a constant feeling of pressure because the settlers seem to spread like weeds, fight against the indigenous people and destroy the parts of the island that they inhabit. Each spirit is very asymmetrical, meaning you get to play the game a very different way depending on which spirit you choose to be. The name of my spirit was “Lightning’s Swift Strike”, awesome name by the way, and my spirit specialized in quick attacks and being able to invigorate the other spirits and help them attack more quickly. Overall I really enjoyed Spirit Island. The game is very hard, on the more difficult end as far as complexity is concerned, but was really fun. I loved the cooperative nature of the game. Each player needs to be actively involved in each round to make sure actions are done in the correct order. I hope I get to play this one again in the future, and if you get the chance, definitely don’t pass it up!